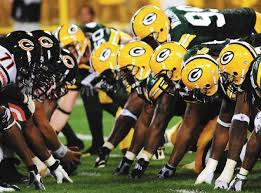 The Green Bay Packers and Chicago Bears take center stage Sunday night in Green Bay as the two teams face off for the 190th time. Here are a few stats to help you prepare for the game. 1. The Packers seem to have a decidedly big advantage playing on Sunday night. The Packers are 22-7 (.759 winning percentage) in Sunday night games, while the Bears are under .500 at 15-19 (.441). 2. Both teams are playing this week after a bye in Week #9, and both have had previous success in the weeks following their bye. The Packers are 16-9 (.640); the Bears are 17-8 (.680). Both teams won last year after their bye: The Packers defeated the Lions 22-9; the Bears won the game after their 2013 bye… beating the Packers 27-20 in Green Bay in a Monday Night Football contest. 3. Chicago leads the all-time series 93-90-6. The Packers are 44-41-4 at home in the series. 4. Since 2008, the Packers have dominated the rivalry by winning 11 of 14 games. Nine of those 14 games were decided by eight points or less. 5. The Pack has won five of the last six games played in Green Bay in the series. The Bears won in Green Bay last year 27-20 in the game Aaron Rodgers was hurt. 6. In the 14 games that have been played in Green Bay since 2000, the team that scored under 20 points was 2-8. The team that scored 20 or more points was 12-6. 7. The two teams have played three times on Sunday Night Football with the Packers winning two of the three. The last time was in 2011 when the Packers won 35-21. 8. As mentioned above, Rodgers was hurt in the Bears-Packers game played in Green Bay last season. In the five previous games played between the two teams in Green Bay, Rodgers was 5-0 vs. the Bears at home. He completed 102 of 147 passes (69.4% rate) and had 10 TD passes and only three interceptions. In all five of those games Rodgers had under 300 yards passing. 9. Rodgers counterpart, Jay Cutler, has had zero success as the Bears QB vs. the Packers in Green Bay. Cutler is 0-3 with two TD passes and 10 interceptions in the three games at Lambeau Field. His QB Rating in those three games was 43.2, 43.5 and 28.2. 10. Eddie Lacy rushed for 150 yards on 22 carries in the Bears-Packers contest in Green Bay last season. It was the most rushing yards ever in a home game versus the Bears. Ryan Grant held the previous mark when he gained 145 yards rushing in a November 2008 game against Chicago in Green Bay.